Watching Shanghai’s accelerated growth, as seen from the World Financial Center (the bottle opener) with the striking Jin Mao Tower in the foreground. 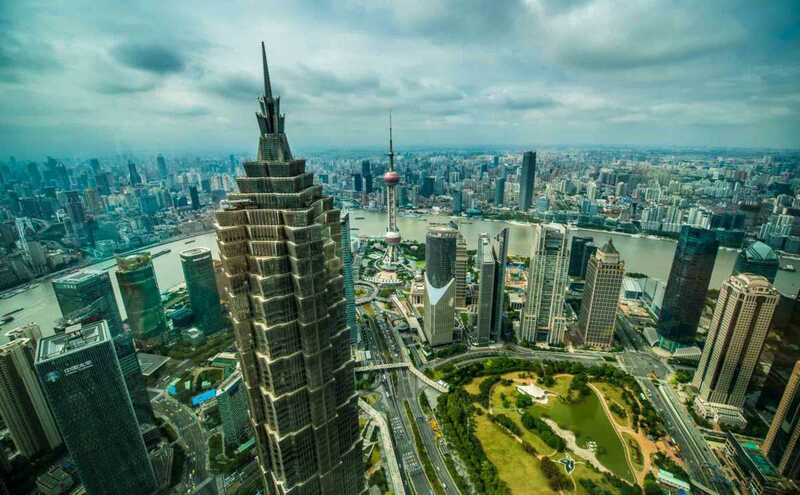 Shanghai is frequently described as the New York City of China. People say Shanghai is to Beijing as NYC is to Washington, D.C. The comparison works. Shanghai is a port city, straddling the Huangpu River which empties into the Yangtze. So it’s open, airy, and brighter than Beijing, with about a 100% chance of less pollution than the inland capital. Shanghai is contemporary, vibrant, and forward looking. We arrived in Shanghai with Viking Cruises, wrapping up our Viking River “Roof of the World” itinerary. But we allowed extra time (yes, that’s our mantra) to take Context Travel’s Accelerated Shanghai tour. That’s how we learned just how new Shanghai is and how fast and constant the change. 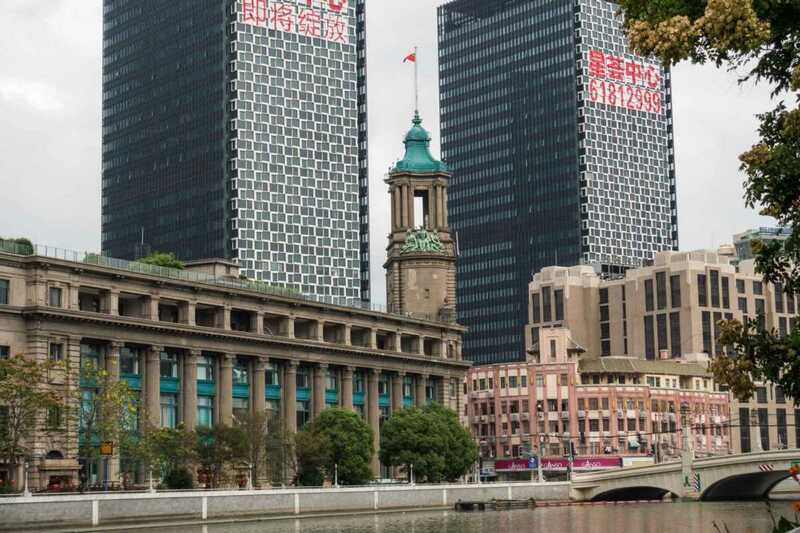 Every visitor to Shanghai is certain to linger over the iconic view across the river, looking from the Bund, the 1920s row of prominent buildings along the river promenade, to the expanse of glittering lights and glass across the river. The astounding part is that the spectacle across the river–the Pudong financial district–was built within the past decade–mostly in the last five years. The Atlantic published a cool photo story of the transition a couple years ago. This shows the “before” I could only imagine: the fishing village of Pudong from the 1980s. The showroom display imagines our patio view from the new Suhe Creek development. 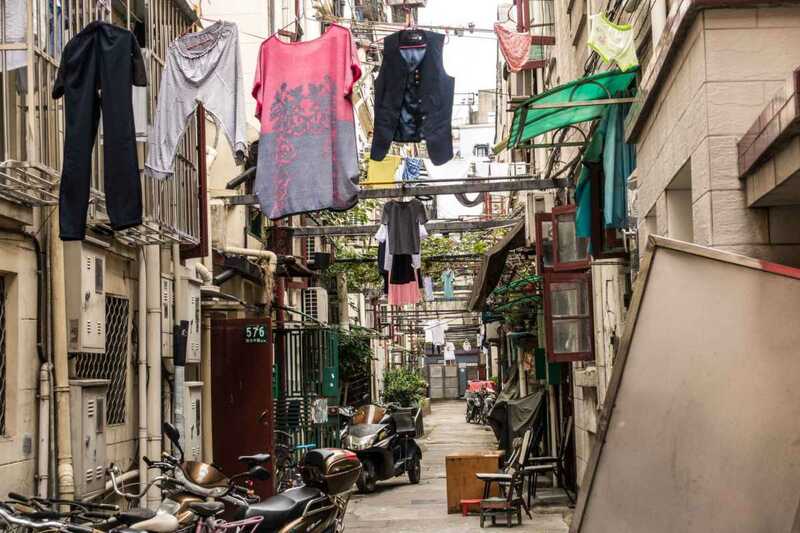 A closer look at the city with Context Travel traces the real change in Shanghai’s residential neighborhoods and the accelerated rate of urban renewal. We began our orientation with our docent, Bert, in the showroom of a new condo building in an area still in transition. Models of the district show it’s strategic place along the Suzhou Creek which meets the Huangpu nearby. This was an industrial zone busy with manufacturing of cotton, warehousing and transportation. New condos and multi-purpose townhouses are ready for occupants, while the lots to the left are next in line for construction. The model doesn’t show the past, but with Bert we were able to walk through it and get views from above. The past included the Lilong neighborhoods, referring to the Shanghai-style housing built primarily from the 1890s-1930s. The tenement housing fit closely together on small alleys, which in turn opened through gates to the main artery streets. 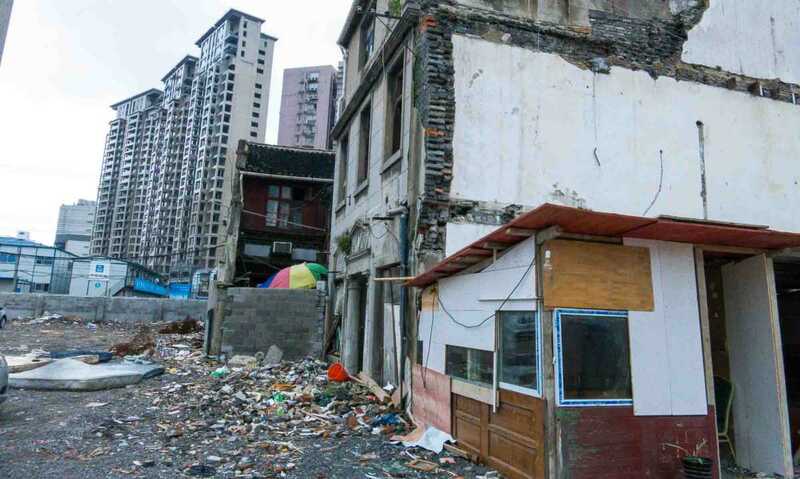 The remaining Lilong–only about 5-10% of Shanghai’s housing today–show how they’ve been used and altered over the years. Multiple entries service multiple families, kitchens are shared, rooms and balconies are divided or enclosed or adapted to suit the current resident. Still, the wooden window frames and tight quarters embracing various ages and occupations elicit a mood of cooperation, of people occupying their own space in time, despite the changing world outside. As new skyscrapers and condos move in, some cling to the old dwellings as long as possible. A contemporary lilong scene in Central Shanghai, not far from the Bund. At best, some development preserves the old warehouses and renovates with a sense of history. Exposed bricks, human-size entries, and access to the pedestrian riverfront and bridges are good signs. The historic Victor Sassoon Residence, once the center of Sephardic Jew refugees in Shanghai, appears to be undergoing a conversion to condominiums. But the new-from-the-ground-up condos are already vying for attention, for river views, and for prestige. Luxury condos might be 150-200 square meters (1600-2200 sq. 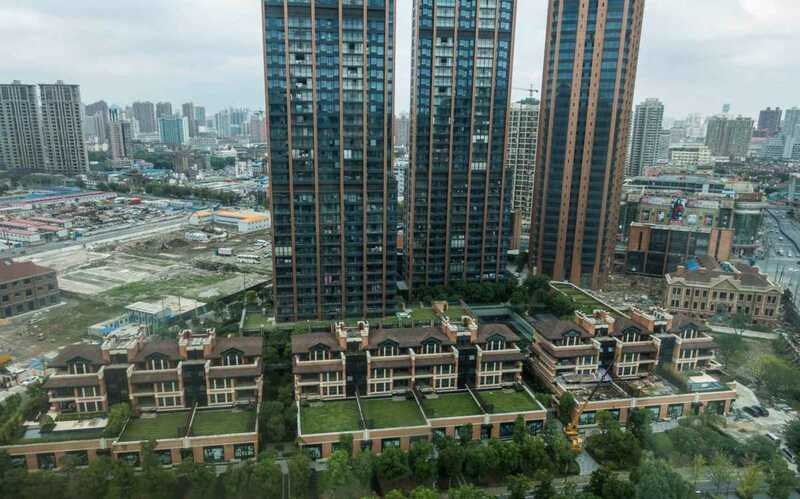 ft.) compared to typical Shanghai homes of about 80 square meters (860 sq. ft.). At $8,000-9,000 per square meter, prices quickly reach around $1.5 million. Bert escorted us to a couple great look-out points. First, from the friendly Jiuchutang restaurant atop the Bund Riverside Hotel and business tower on Suzhou Road we could view the past: the empty lots we’d just walked and the transitional areas. Then, after some deft maneuvering through the crowds on the ferry, we looked at the future from the upper floor bar in the Shanghai World Financial Center. Only with a tour like this can a casual visitor to Shanghai see the scale of the place. The fastest growing city in the world deserves this close look. Our visit to Shanghai fell over the Golden Week holiday in early October. What started as China’s National Day was expanded in 2000 to a full week to promote domestic tourism and build commerce. The economic boost seems to be working. Shanghai was packed with Chinese visitors. Our Viking accommodations, at the Peace Hotel Fairmont right on the Bund, were in the thick of the crowds. In the evenings, streets were closed and rows of police kept the masses shuffling along. It was so packed, Tom and I ventured out separately to navigate to the river edge for photos so that we wouldn’t have to keep track of each other. Neither of us lasted more than about 20 minutes in the throngs. They don’t call the Old Jazz Band old for nothing. Average age is 82. Presumably that doesn’t factor in the vocalist. Our Roof of the World Yangtze River Cruise, with side trip to Tibet, was hosted by Viking. We were also guests of Context Travel’s Accelerated City tour. 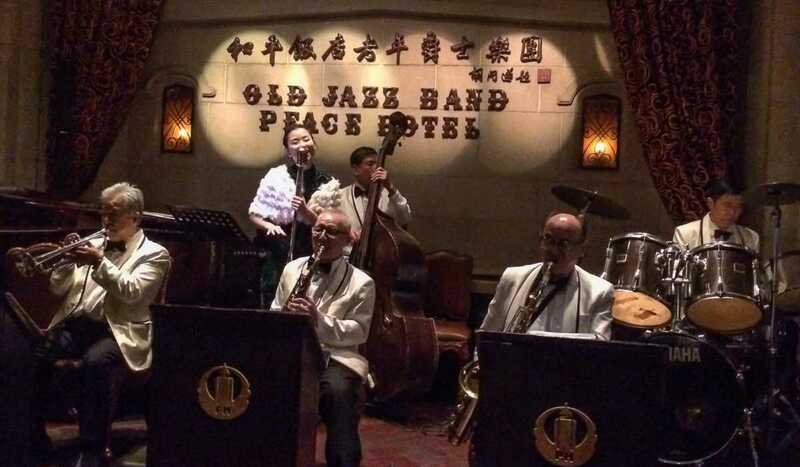 Thanks, too, to Peace Hotel Fairmont for inviting us to check out the oldest jazz band in the world, performing nightly in the hotel lounge. 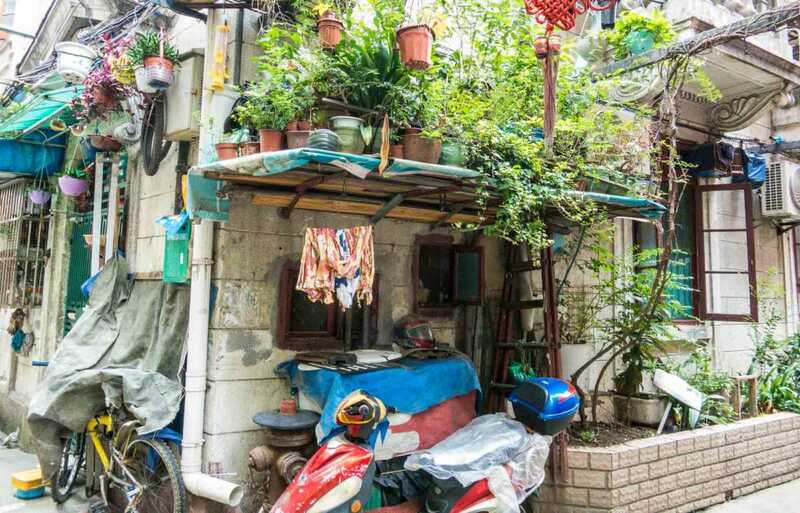 Maximizing space and urban gardens in a central Shanghai Lilong. 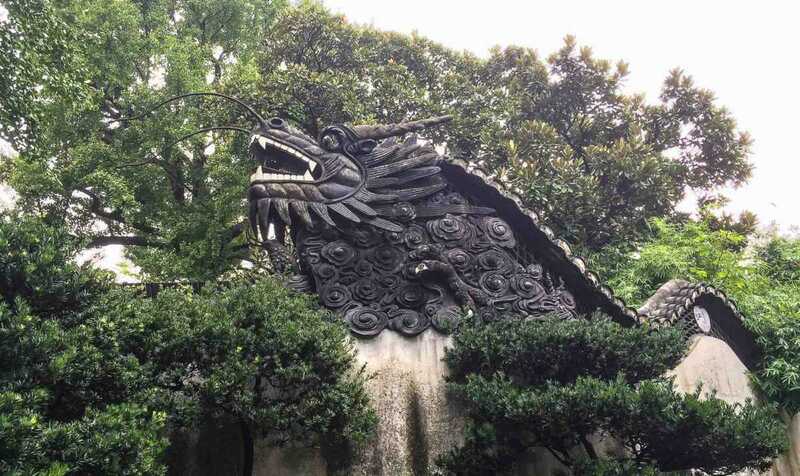 Elsewhere in Shanghai, the 16th Century Yuyuan Gardens provide green space, a look at beautiful tea house and opera house constructions, and entry to…shopping, of course, at the adjacent Yuyuan marketplace. You can see more views of Shanghai, specifically the Shanghai skyline and The Bund, in this post. What an evocative glimpse into life in Shanghai. So sorry to see the old neighborhoods disappearing but still life goes on and looks like it does so well. Wonderful pictures too! Thanks, Elaine. I’m looking forward to seeing where your travels take you in 2017. I just love your photos of Shanghai. By the way, I was visiting Shanghai in the early 80s and can appreciate the growth which has occurred between then and now. Thanks for a wonderful article! Thanks a lot Denis. This is a combination of Tom’s and my photos. I think it’s important to capture more than the popular shot of the skyline across the river. We really appreciated the ground level views that Context Travel provided us. I would love to visit Shanghai. Your opening photo is amazing! But I am concerned about how I would handle the congestion of people and traffic in the city. I guess I won’t know until I get there! Thanks, Doreen. That is Tom’s opening shot. I Imagine if you avoid the big holidays in February and October that the crowds wouldn’t be as big a factor as we faced. In both Beijing and Shanghai, we found subway systems easy to use and not terribly crowded outside of rush hours. Have fun – when (not if) you go.